Whilst working at Sony over the last 6 months I haven't really been able to write about it very much on currybetdotnet - in stark contrast to the way I used to blog the absolute minutiae of working at the BBC. This was mostly due to the fact that the part of Sony I was working in, Sony NetServices, acts as a service provider for other parts of the Sony empire and other large European brands like Vodafone and I was therefore swamped with NDA complications. Additionally, defining the user experience is done pretty up-front in the product development cycle, and so most of the things I have worked on are commercially sensitive, and won't see the light of day until later this year. However, in the last couple of weeks, two of the projects that I worked at during my time in Austria have gone live to the public, and so I'm able to write about them. 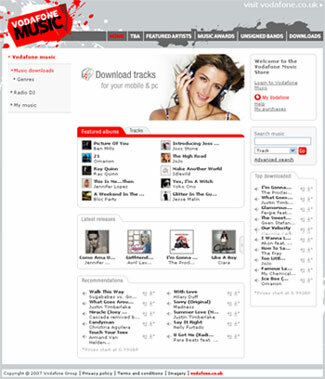 The first of these is a revamp of Vodafone's online music store in the UK. 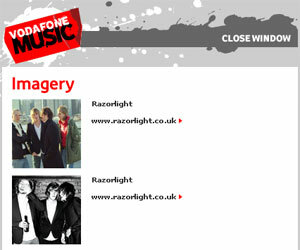 In the last couple of years Vodafone in the UK have had quite a divergent musical offering. Online and on handsets you could download full length tracks, or stream music through the personalised Vodafone Radio DJ service. In addition, last year Vodafone put on a series of gigs called "TBA". The premise was that a band or artist would be playing for free in a surprise venue, and by being a Vodafone customer and entering a competition using your phone, you could get the tickets for it. They had some leading lights last year as part of the series, including Franz Ferdinand in Dublin, Snow Patrol in Covent Garden, and Razorlight. However, all of these services had different websites, with different entry points into the service. One of the biggest barriers to using the Vodafone UK music store is the number of clicks it actually takes from hitting the vodafone.co.uk homepage to reaching a page where you can actually buy music. 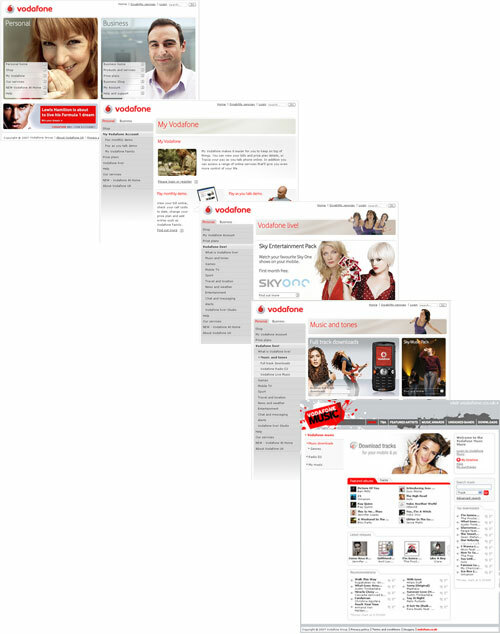 Users have to choose any of the 'Personal' options from the front-page, then choose Vodafone Live! from the left-hand navigation, then choose Music and Tones, and then choose Full Track Downloads, and then launch the service, before they can see what is available to buy. And to find out about the TBA gigs, or Vodafone's "Live Hour" podcast, or the Vodafone Radio DJ service, the route was just as torturous. 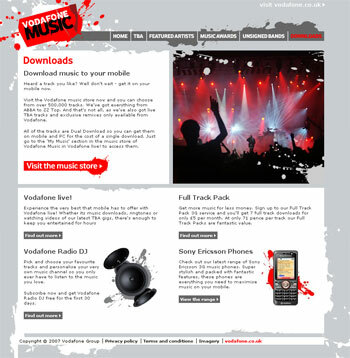 The solution that was launched this week is to provide vodafonemusic.co.uk as a top-level URL that marks the entry point to all of Vodafone's music related services. From the point of view of the music store, this meant integrating the new global music branding and navigation across the site. 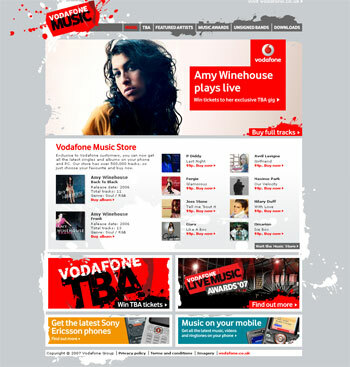 So, for the first time, from one URL, Vodafone can simultaneously promote their series of live shows, this year starting with Amy Winehouse, and sell full track music downloads from the same page. The 'Downloads' link in the main horizontal navigation take the user through to a page promoting the service. This has a much clearer explanation that the dual download service means the user only pays once and is able to download a track to both their Vodafone mobile phone, and their PC. And I do mean PC - the service is for Windows users only due to the DRM implementation. Once clear usability benefit came out of the branding change across the music store. 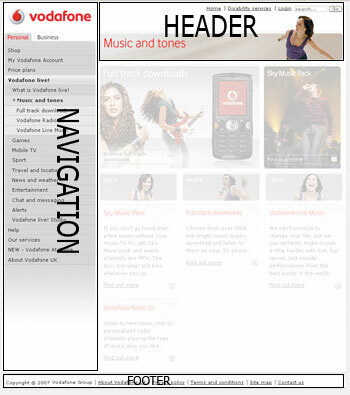 It used to be the case that the full track music download service had to be displayed in a new window, as it didn't fit into the last design of the Vodafone UK web portal. This has a rigid and narrow C-shaped surround of header, left-hand navigation and footer. The new header'n'footer UK music branding removes the need for spawning a new window, and so the offering seems much more tightly integrated. There is one negative I spotted straight away in the implementation. In the footer on every page is a link "Imagery", which doesn't make much sense. It makes even less sense when you follow it, and it leads to a page with some pictures of the artists who played in last year's TBA gigs. It looks to be a hangover from last year's site which nobody has thought to remove. On the plus side, however, support for Firefox seems better in the new implementation. Although the music store as supplied by Sony NetServices only officially supports Internet Explorer, with the new navigation and branding in place it is possible to browse down to the track detail level using Firefox. By Martin Belam on 4 April 2007. Excellent to catch an old Sony colleague online. Just read your post and I have my own "blog post" which covers my experience with and opinion of the same service (I left before you started I think).